it was the information below that inspired us. Edited by Ferelith Hamilton; Editor of Dog World (England); breeder, exhibitor and international judge at championship shows. Associate editor in America; Mr. Arthur F Jones; for many years Editor and Editor in Chief of Pure - Bred Dogs, American Kennel Gazette; author and editor of many books on dogs; well - known television and radio commentator on dogs. 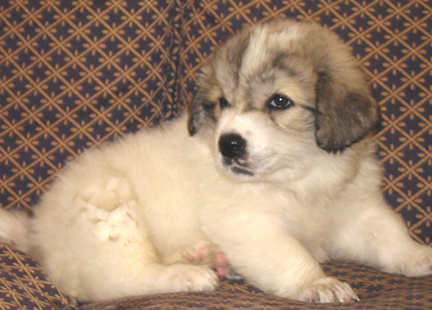 "Color: The assumption that the pure bred Pyrenean must be white is erroneous. The permitted colors are all-white or mainly white with markings of badger, gray or varying shades of tan, mainly on the head, or at the root of the tail. Badger, or blaireau, as it is called, is an admixture of brown, black, gray and white hairs and is common in puppies, but generally fades on maturity. Patches of pure black are not admitted in the show ring, although black and white dogs sometimes appear in correctly color-bred litters. The desired jet black nose, lips and eye rims still cannot be maintained in successive generations of all-white dogs without breeding back to the colored mountain type. It is noticeable that not only pigment but increased size and vigor become apparent when color is introduced into the all-white strain, and in spite of the lack of scientific support for the fact, all-white breeding tends to produce progressively smaller Pyreneans."